For Hex’s first trip in the TARDIS, it’s about the strangest place he could have imagined. Weird and very far from wonderful. Adjustment to his new life could prove tough. But he will have to adjust and do more, just to stay alive, and Ace will have to be his guide through this lost city of shadows and predatory dreams. And the Doctor is the first to go missing. 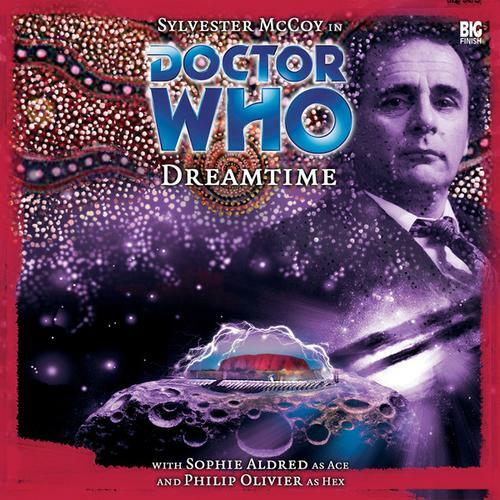 Sylvester McCoy is the Doctor in Dreamtime. Some people barely remember their dreams. Some people dream in black and white. Some people dream in color. Some people can hear their dreams, while others enjoy only silence. A small number enjoy all five senses in their dreams, and a very select few can control their dreams to a limited degree. No matter how someone experiences a dream, they never experience the whole picture. Usually the dreamer finds themselves in media res with no idea how they got to where they are. Some dreams are faint imprints upon a memory, and other dreams are so vivid, so intense, they remain burned into one’s memory for days, weeks, months, even years on end. Sometimes, a dream can contain a message, perhaps a missive from the subconscious to the conscious mind, either a subtle, mystical hint about the future or a personal declaration that hits with the metaphysical force of a sledgehammer. By their very nature, dreams are jumbled fragments with a muddled message. Which makes the title of this audio incredibly appropriate. Dreamtime is a mess of an audio. The Doctor, Dorothy/Ace, and Hex find themselves on a mysterious asteroid where a domed city has sprung up around a famous natural landmark usually found on Earth. An attempt to utilize a vital Australian spirituality is poorly explained and mismanaged (with some unconscious consequences), contributing to a weak script and sleepwalking performances from several of the main cast. There’s a famous stone formation near the center of Australia. 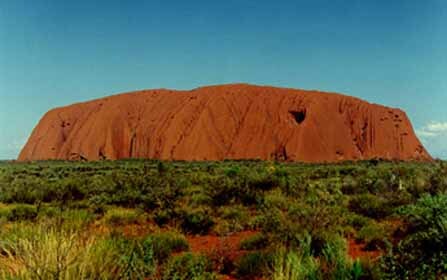 To the colonial Australians, it’s known as Ayers Rock. To the local Aboriginals, it’s known as Uluru. The West sees it as a tourist destination, to be marveled at and climbed if one is willing. The native people of Australia view it as a central piece to their spiritual beliefs regarding the time of Creation they know as “The Dreaming.” The Doctor, Dorothy “Ace” McShane, and Hex see it as the centerpiece of an abandoned city that sits on the heart of a massive asteroid, far from Earth. Lifelike statues of the city’s citizens line the streets, faces frozen in terror, lost forever in what the handful of survivors call the Dreaming. Alongside a well-armed trade delegation from an alien race, the Doctor and his companions attempt to unweave the mysteries of Uluru, but how can the trio survive when the spiritual energy of the Dreaming prevents them from separating friend from foe…and visions from reality? Warning – I’m a little wary writing this review as I know very little about Aboriginal culture and the Dreaming. In writing about an actual belief system still being followed today, I want to make sure I get as much right as I can. I apologize in advance if I get anything wrong! In order to have any understanding of what’s going on through Dreamtime, it’s important to have some idea of what the Dreamtime and the Dreaming are. Pulling from Wikipedia, “Dreamtime” is defined as “ a concept of ‘time out of time,’ or ‘everywhen,’ inhabited by ancestral figures, often of heroic proportions or with supernatural abilities, but not considered “gods” as they do not control the material world and are not worshipped.” Creation, according to Aboriginal beliefs, came about as heroes traveled a formless, shapeless land, their actions and adventures establishing sacred sites (such as Uluru/Ayers Rock) along the way. The legends of the Dreamtime, much like the mythologies of other culture, can serve as a narrative source for some great modern day stories. Sadly, the script for Dreamtime doesn’t hold up to its potential. Simon Forward has penned numerous Doctor Who spin-off materials, as well as the Big Finish audio The Sandman. In that story, Forward managed to lay out the necessary exposition for the conflict between the Sixth Doctor and the Galyari with ease. In Dreamtime, however, Forward forgoes any attempt at exposition and lays everything out in a straight forward, simple manner. The story explains very little with regards to the Dreaming or Dreamtime, as if Forward was expecting primarily Western listeners to know what they needed to know about the concepts before diving ahead with the story. Everything is unexplained, glossed over, or handwaved away, from just why the inhabitants of the doomed city are being turned to stone and absorbed back into the Earth, or who exactly the Dream Commandos are and what they do and why they’ve lost the fight to save the city and its citizens, or just who Baiame is other than a wise old sage/man, when in reality he’s one of the central figures of Aboriginal myth…but from listening to this story, one never would have known it! One could take another mythological concept, real or fictional, and plug it in place of the Dreaming, and the story will still make the same amount of narrative sense. It doesn’t help that, Dreaming aside, Dreamtime simply isn’t a well put together story. The Sandman suffered from being dull as dishwasher. Dreamtime suffers from being confusing. Scenes move with very little narrative between them, human characters do little more than talk about how there’s nothing they can do, threatening images from the Dreaming show up for one scene/plot thread and are never mentioned again, and there’s little to no explanation of WHY things are happening other than “The Dreaming started to change the environment early.” There’s some mention of “forgetting our roots” and “going back to the old ways,” but it’s too little, too late, or too little, at the time. The Doctor, Baiame, and the Dream Commandos spend a lot of time talking about the mysticism of the Dreaming. This is the second Big Finish audio to deal solely with the mystical without any scientific explanation (the other being Loups-Garoux, and for some the lack of a scientific/alien bent is a slight upon that story), but instead of being “firm” with the mysticism, the characters are “vague,” with too much talk in riddles and not enough talk in any semblance of fact. The Dream Commandos, who have experienced the horrors of the Dreaming first hand, only speak about its danger and how hard it is to pull someone out of it. The only mention of anything science based, and the only mention of anything concrete, is a strange scene where the Doctor is thrown back in time to Earth, just before its hit by solar flares, where Baime is about to pull Uluru/Ayers Rock into space to save his people from destruction, and even then it’s tinged in mysticism, as in “how the HELL does someone pull an entire rock from space and throw it into orbit” before the Doctor causes a predestination paradox of sorts since the whole mess with the Dreaming becoming active is somehow HIS fault, and by that point in the second episode I really could have cared less. It’s a bit ironic that the Galyari, the most openly alien aspect of the story, are the only ones who make any semblance of sense, with their focus on trade first and using sonic weapons against the forces of the Dreaming! In a way, the presence of the alien, as in foreign to the city, Galyari ties into something that made me the most uncomfortable about this serial. In Australia, there’s still an ongoing discussion over the “relationship” between the Australians and the Aboriginals and how to coexist with one another, not just in terms of physical space but in terms of respecting the traditions of each other’s culture. Again, I know very little about the topic and won’t go into it here out of respect. But one could make the case that the Galyari, who have come to the domed city to establish trade, are the “Australians” and the inhabitants of the city are the “Aboriginals.” And I say this because, during the course of Dreamtime, one of the survivors mentions that over time, the Aboriginals and the few Australian survivors from Earth have “blended together” into a new culture. This is a fine concept, and cultural blending and adaptation are familiar concepts to Doctor Who. But the story is INCREDIBLY steeped in Aboriginal lore…and all the actors and actresses are white Europeans. Even Baiame, a central figure to Aboriginal lore, is played by a white European. And the day is saved as the Doctor uses Galyari (“Western”) technology to overcome the mystical (“Aboriginal) Dreamtime. Maybe it’s because of the script’s obvious problems or the subconscious racial concerns, but the acting in this story is subpar as well. Where Davison, Baker, or McGann can elevate a script with their performances, the quality of Sylvester McCoy’s acting seems to be directly proportion to the quality of the script. McCoy sleepwalks his way through Dreamtime, getting off a few good Seventh Doctor witticisms and puns, and raging/pleading at the appropriate time against the appropriate figure (Baiame at one point, Commander Korshal at the other). Perhaps it’s the lack of a defined central villain that lessens the presence of the Seventh Doctor. Sophie Aldred and Philip Olivier are given less to do. Hex is the highlight of the story, with his sense of wonder and awe at being in space a joy to listen to. The quiet at realizing he’s floating on a rock in space is balanced against “holy crap, lizards” Hex exclaims when he sees the Galyari for the first time. But he gets shuffled onto a “rescue mission” to save the Doctor, while a wounded Ace is left with the Galyari “for her protection.” It really should have been the other way around, and if Forward was attempting to turn the “Ace saves the Doctor, Hex gets coddled” concept on its ear, more and better time should have been dedicated to it. More time is instead spent following the Doctor through the past and through the Dreaming, and even then it just doesn’t come off as interesting, or even confusing enough to be interesting. And perhaps for the first time that I can recall since beginning these reviews, I can’t feel arsed enough to look up the supporting cast. They really didn’t stand out in any major way. The human characters, both survivors and Dream Commandos, were interchangeable, and Baiame bounced from being a vengeful shaman who could throw Ayers Rock into space to “just an old man” who needed the Doctor to save him from an angry Commander Korshal…and the only reason Korshal and Vresha, the two main Galyari, stand out is due to the voice modulation used, given them a separate identity. That’s a bit cruel, though, since Korshal is looking to save his men through his (misguided) effort to kill Baiame and Vresha realizes there’s something more going on. I save the scores of “1” for truly horrible stories that shouldn’t be listened to by anyone…well, everyone should have to suffer though Minuet in Hell…but Dreamtime came very close to snagging this dubious honor. It’s a story that’s poorly put together, makes little sense, has no narrative explanation, poor characters and less solid acting, and a very uncomfortable underlying message. I’d call this story a The Unicorn and the Wasp type of story. You listen/watch it for one thing (Philip Olivier’s performance/”Harvey Wallbanger?! ?”), but beyond that there’s nothing redeeming or worthwhile. If you’re a completest, grab Dreamtime, but otherwise, I’d recommend sleeping on this story. Synopsis – Unfortunate racial implications, a poor script, and a complete misuse of Aboriginal mythology make Dreamtime a hard serial to recommend in any capacity. 2/5. Colin Baker is the Doctor in…Catch-1782. This entry was posted in Big Finish Review and tagged 2/5, Ace, Big Finish, Doctor Who, Doctor Who Audio, Doctor Who Review, Galyari, Hex, Philip Olivier, Seventh Doctor, Sophie Aldred, Sylvester McCoy, TARDIS. Bookmark the permalink.